The pedestrian-friendly event runs through more diverse neighborhoods than last year’s, which drew nearly 40,000 people. 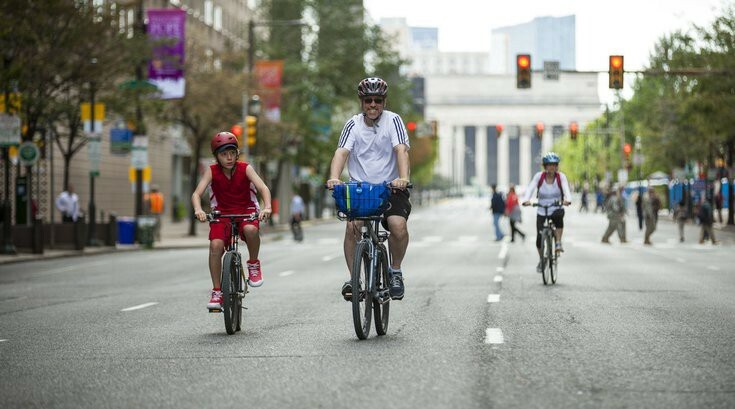 Philly Free Streets, the day when a portion of the city closes down traffic that was inspired by the 2015 visit of Pope Francis, is back — and this fall it cuts a car-free path stretching from Old City to North Philly. The event will take place on October 28. Seven miles of roads (3.5 miles in each direction) will be closed to automobile traffic, along Third and Fourth streets from Chestnut Street, continuing on Germantown Avenue and Fifth Street up to El Centro de Oro at Indiana Avenue. Food and entertainment will be offered along the route and finalized later. Last year’s Philly Free Streets closed down South Street essentially from river-to-river and continued along the Schuylkill Trail on to MLK Drive and Fairmount Park. This year’s route is much more urban and follows a path through neighborhoods with more communities of color. One of the complaints about the 2016 event, which attracted around 30,000 to 40,000 people, had been a lack of diversity. According to the city, 27 percent of participants identified as minority. Philadelphia is a majority minority city. Philly Free Streets came to fruition in 2015 after Pope Francis’ visit. The chaos feared by many Philadelphians had turned into bliss, as bikers and pedestrians enjoyed having basically all of Center City to themselves for a weekend. The group Open Streets PHL was launched and partnered with the city to create the first Philly Free Streets for last fall.